삭제,포멧,파티션 분할 했던 하드도 복구를 해줍니다. 시리얼 번호를 입력해야만 사용이 가능합니다. ㅡ.ㅡ;; 플레쉬메모리카드의 사진이 삭제되었으면 일반적으로 복구가 불가능합니다. 이 프로그램은 포멧된 또는 복구 하고자하는 드라이브에 설치를 권장하지 않습니다. 복구하고자하는 하드 내용이 덮어쒸우기가 되므로 파일 복구율이 떨어지기 때문입니다. * 참고자료: 1. 기본적인 하드 데이타 복구율 2. 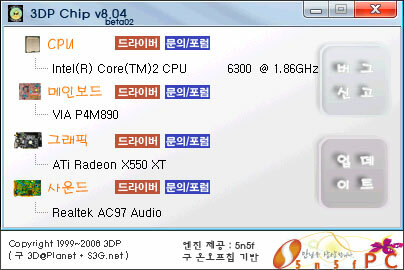 출처 : http://www.3dpchip.com/3dp/chip_down_kor.php www.vga.pe.kr 퍼왔습니다. vga.pe.kr 사이트가 안열리면~ ^^; 드라이브 검색은 http://simfile.chol.com/ http://pds.hanafos.co..
출처: www.glob.com.au/sendmail fake sendmail for windows fake sendmail © 2004-2008 byron jones bsd license glob.com.au/sendmail sendmail @ glob.com.au about sendmail.exe is a simple windows console application that emulates sendmail's "-t" option to deliver emails piped via stdin. it is intended to ease running un..
프로그램출처: http://pogostick.net/~pnh/ntpasswd/ This is a utility to reset the password of any user that has a valid local account on your Windows system. Supports all Windows from NT3.5 to Win8.1, also 64 bit and also the Server versions (like 2003, 2008, 2012) You do not need to know the old password to set a new one. ..
출처: http://snoopybox.co.kr/1169MS 다운로드 사이트: http://www.microsoft.com/windows/virtual-pc/download.aspx 윈도우 7의 XP 모드 기능은 프로페셔널 에디션 이상에서만 사용 가능한 것으로 다들 알고 계실 것입니다. 하지만 정확히 표현하자면 버추얼 PC의 통합 기능 사용을 프로페셔널 에디션 이상으로만 제한해둔 것이 아닙니다. XP 모드의 사..
========================= CmosPwd Christophe GRENIER grenier@cgsecurity.org http://www.cgsecurity.org ========================= CmosPwd is a cmos/bios password recovery tool. CmosPwd is under GNU Public License. You can freely distribute it. 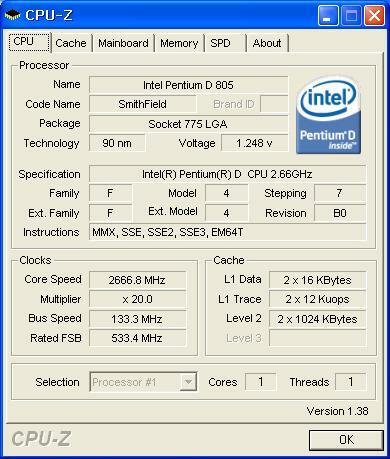 It can be compiled under Dos, Windows, Linux, FreeBSD and NetBSD. 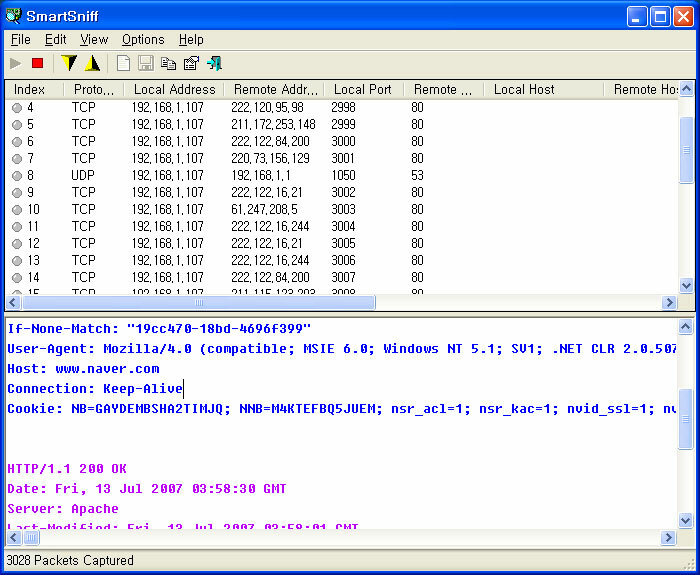 Platforms - Dos-Windo..
SmartSniff v1.30 Copyright (c) 2004 - 2006 Nir Sofer Web site: http://www.nirsoft.net Description SmartSniff allows you to capture TCP/IP packets that pass through your network adapter, and view the captured data as sequence of conversations between clients and servers. You can view the TCP/IP conversations in Ascii mode (for text-b..
cpp 성능을 알 수 있습니다. 아래 사진 ↓ 메인보드 명,그래픽카드 슬롯을 알 수 있습니다. 아래 사진↓ 메모리 형식을 알 수 있습니다.↓ 종합적인 정보를 html문서로 출력해줍니다. ↓ * 참고자료: 1. .. Protected Storage PassView v1.60 Copyright (c) 2002 - 2003 Nir Sofer www.nirsoft.net Description Protected Storage PassView is a small utility that reveals the passwords stored on your computer by Internet Explorer, Outlook Express and MSN Explorer. The passwords are revealed by reading the information from the Protected Storage. Star..
출처: http://www.jonetech.net/* 프로그램 특징 * 1. 별도의 장치없이 프로그램 만으로 컴퓨터 사용시간을 제한할 수 있습니다.2. 컴퓨터 시간이 실제 현재 시간으로 자동 동기화 됩니다.3. 암호 없이 설정을 변경하거나 절대 제거할 수 없습니다.4. 사용방법이 매우 간단하고 쉽습니다.5. 전일 컴퓨터 사용시간을 메일로 받아 볼 수 있습니다.6. 다중 사용자를 지원합니다.7. 사용시간 제한 외에 기능에는 제한을 두지 않았으므로 사용에 불편이 없습니다. (예, 레지스..
웹브라우저 사용시 오류를 수정해주는 프로그램입니다. 익스플로러 7.0은 테스트되지 않았습니다. 윈도우 exploer 삽입하라고 나올경우 cd없는분들 윈도우 xp 파일은 아래 다운받아 위치 선정하세요 2번 나오는데 중요:-->>> 파일 선택하시면됩니다. [XP_CD 없는분들 다운로드] 윈도우98은 필요없음~ * 참고: 프로그램 실행시 429 런타..
출처: http://www.windowdrv.com/bbs/board.php?bo_table=drv_printer&wr_id=614캐논 PCL5e/PCL5c 프린터 드라이버 VER 8.0 (한글버전) 입니다. 파일을 다운 받은 후 압축을 풀면 C:\CANON 디렉토리에 자동으로 압축이 풀립니다. 프린터 드라이버 설치는 제어판 --> 프린터--> 프린터 추가를 실행한 후 제조업체 선택 화면에서 "디스크 있음"을 선택한 후 "c:\canon" 디렉토리를 지정..
출처: http://downloadcenter.intel.com/Detail_Desc.aspx?agr=Y&DwnldID=21527&lang=eng&OSVersion=Windows%207%20(32-bit)*&DownloadType=Drivers%20 Operating Systems:Windows 7 (32-bit)*, Wind..
시디키가 있어야 합니다. ^^ PowerQuest(R) PartitionMagic(R) 버전 8.0 목차 ---- 1. 시스템 백업 2. 일반적인 사용법 3. 알려진 문제점 - Windows NT/2000/XP에만 해당 4. 알려진 문제점 - Windows 9x에만 해당 5. Windows Me 제거 6. PowerQuest Storage Manager 소식지 1. 시스템 백업 -------------- PartitionMagic을 사용하기 전에 하드 드라이브를 백업해야 합니다. PartitionMagic은 철저한 테스트를 거쳤지만 정전, 운영 체제 버그 및 ..
출처: http://driverpacks.net 3Com 3CRPAG175 PCMCIA a/b/g 07/11/2003,1.0.0.25 3a 3Com 3CRSHEW696 USB b 1/28/2003, 1.0.1.14 3b 3Com 3CRDAG675 PCI a/b/g 08/01/2003, 1.0.0.25 3c 3Com 3CRWE154A72 PCMCIA a/b/g 04/07/2004, 3.0.0.46 3d 3Com 3CRWE62092B PCMCIA b 08/04/2003, 2.1.1.3005 3e 3Com 3CRWE62..